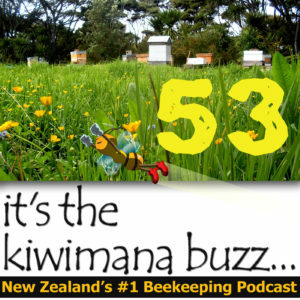 Well it's spring here in New Zealand , in this podcast we discuss what you need to be looking for in your hives at this time of the year. We also discuss Inspection Tips, a Horrible Whodunit and the five regrets dying people have. You can play the show by clicking the play button on below page or search for 'kiwimana' on your podcast application of choice. I enjoy your podcasts as a newbie beekeeper and am slowly listening to them all whilst driving to work. My wife and I spent a very happy year working in New Plymouth in the early 90's, so got to know your beautiful country a little. Thanks for the feedback Ingo, cool to hear you are enjoying the show. Please get in touch if you have any questions that you would like us to cover. Cool that you have worked down in New Zealand, did you place you worked have a great view of Mount Tarankai? Maybe in Westie land, but not down here yet. Honey bees are just waking up this week down South and just as well as there is not much in the way of blooms yet to sustain them. Plum trees are just kicking in down here, lovely warm (15+ deg C) afternoon, not a breath of wind- nor a cloud. How is Auckland? Willows are sitting with swollen buds, so it will not be long for those either. Guess the limited afternoon flight time for the local bees will have to be limited to the Plum's and Erica Heathers for the next week or so. Still nice to see them back on the gathering scene again. Hopefully next week will be better and we can check some of the hives. Do you listen to our podcast, I know a few people in the south island are downloading it.